Marshall’s Landscaping are experts in garden landscaping and we have worked on many tranformations for customers in Halifax and the surrounding region. 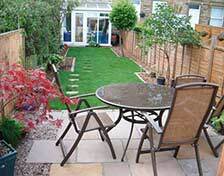 Our extensive range of soft and hard garden landscaping services means that our team are skilled and experienced in transforming gardens, with thousands of happy customers enjoying their new outdoor spaces. Our services include paving, fencing, water features, retaining walls, rockeries, irrigation, lighting, decking, planting and turf laying. Our dedicated and passionate landscaping team have a love for gardens and the great outdoors. 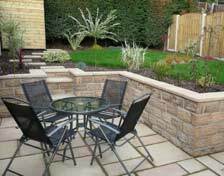 Our customers benefit from the fact that our business is set up to undertake purely residential landscaping projects. Without the pressure of large, monotonous contract work, our team’s complete focus is on providing a personal service at competitive prices. The smaller scale, more personal nature of this type of work requires varied skills and keeps our team interested, enthusiastic and keen to face new challenges. 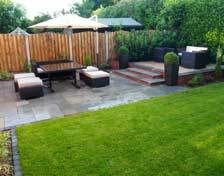 Courteous, helpful and passionate, we are landscapers who you will happy to have working in your garden. If you are based in Halifax or nearby and would like to know what we can do for you, please contact us on the number above, or using the form on this website. We will gladly visit you and your garden to discuss the potential transformation, what ever the scale, and provide you with a prompt, detailed and competitive quote. Browse our website and contact us today to find out more.